The aircraft-grade aluminum and solid welded frame make this chair sturdy and safe, and thanks to the innovative frame design, it's able to maneuver easily through narrow aisles. The swing-back armrests aid in decreasing the overall width when necessary, and the 11?, extra-long reach push handles promise ease of use for the caregiver. Swivel and height adjustable footplates ensure comfort for many different users, and the snap-in safety belt and easy-access brake locks provide ease of mind. On the convertible model the 24? 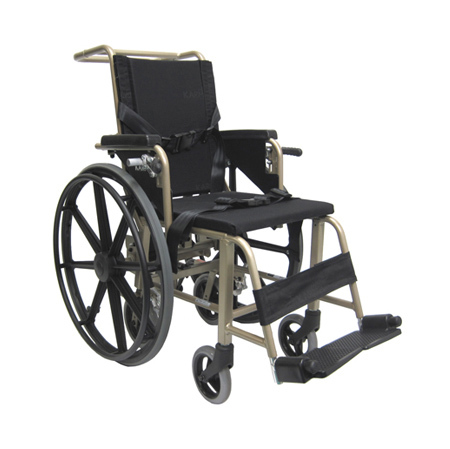 large rear wheels are flat-free and feature a foot-operated quick release for easy conversion to the aisle transport chair.